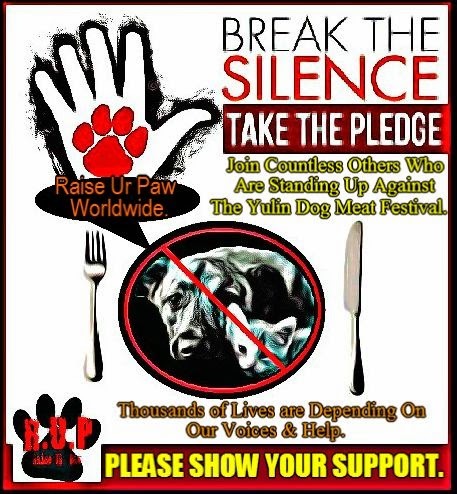 This letter in which I write goes out to each and every individual, media source, and Government worldwide in hopes that they will come together as humanity and take the pledge to stand up to Ban the Yulin Dog Meat Eating Festival, which is scheduled to take place on June 21, 2015. We are appealing to all humanity worldwide in order to reach responsible Governments to intervene and make the step forward to not only ban this longstanding tradition, but to also put into place legislation for the protection of the rights and welfare of these animals – The Governments need to acknowledge that turning a blind eye to this event and trade is no longer acceptable. It is imperative that the Governments and the world are aware of not only the inhumanity and barbarism that goes along with the process of this festival and trade, but the issues and concerns that are being raised about the consumption of such meat ex: the contraction and spreading of diseases/viruses, such as rabies, which pose health and safety concerns on the individuals consuming and even preparing the meat. These concerns and issues need to be dealt with urgently, and failure to do so may jeopardize their tourism, reputation, and the beautiful country in which they possess. We as humanity can no longer leave the responsibility up to those individuals who are standing on the front lines and taking action to save these innocent victims - this is a duty that needs the whole world to take part in, to raise our voices and paws united in order to save these babies and finally give them a voice.
" I AM NOT" - a poem to Raise Ur Paw Worldwide.